In 2015, Ottawa Hills made history by becoming the first and only school district in the state to earn A’s in all categories on its district and building Local Report Cards. In 2016, the district repeated that feat by earning A’s in all categories of the Local Report Card. Once again, we were the only school district in the state to accomplish this feat. Now, in 2017, we’ve done it again. With the Ohio Department of Education’s issuing of the Local Report Card for the 2016-2017 school year, Ottawa Hills sits alone as the only school district in the state to earn A’s in all categories on the district report card. The Local Report Card is just one piece of a bigger picture that defines whether a school district is getting the job done. However, at a time when many school districts are experiencing a substantial decline in their Local Report Card ratings, it is notable that Ottawa Hills students continued to improve their performance, earning the highest rating possible in all categories. That’s a sign of a strong school with hard-working students, dynamic teachers, involved parents, and a supportive community. To see our district’s Local Report Card, you can visit the Ohio Department of Education website. 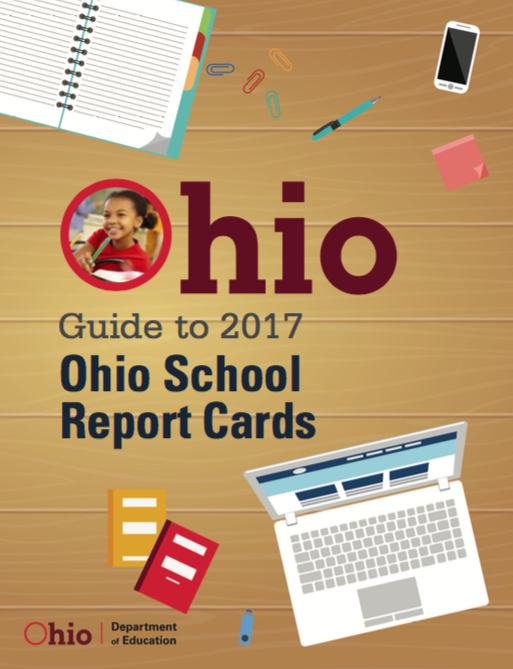 You can access the Report Cards of all districts in the state of Ohio by clicking on "2016-17 Ohio School Report Cards." The report is very involved, not only at the district level, but also for our individual school buildings. However, following is an administrative summary of the various categories on which the district was rated on the 2017 Local Report Card. The first piece of information I’m proud to share helps lay the foundation for our outstanding Report Card results. The Report Card includes financial data which measures the district’s spending habits. 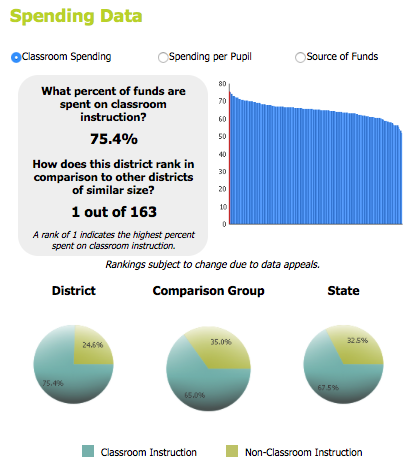 This data shows that 75.4% of district funds are spent on classroom instruction. This compares with the state average of 67.5%. Districts that are comparable to Ottawa Hills as far as demographics spend 65.0% of funds on classroom instruction. When compared to 162 other school districts of similar size statewide, Ottawa Hills ranks #1 in percentage of funds spent on classroom instruction. This outcome affirms our focus on maximizing learning for all students while being good stewards of the finances that are provided to us by our taxpayers. This is not a category for which our district receives a “grade” from the Ohio Department of Education, yet it is information that affirms our commitment to focused, smart spending that first and foremost supports academic opportunities for our students. Those are your tax dollars at work. Academically, Ottawa Hills received an ODE-assigned grade in five different categories with seven subcategories. Generally, with the exception of the Graduation Rate, the grades are based on our students’ performance on state tests that they took last February through May. Again, remember that these grades are a “snapshot” of our school based upon those test results. The first category of “Achievement” has two subcategories. The first is the Performance Index. Only 6 school districts in the state earned an “A” in this category. Fo r each test our students take, they score at one of five levels: Limited, Basic, Proficient, Accelerated, or Advanced. There is also an “Advanced Plus” category which is specific to the test results for students who are accelerated in a course. The district receives a “1” for a test on which a student scores proficient. Accelerated and Advanced tests score at “1.1” and “1.2” respectively. So the more tests that are at the top levels of Accelerated and Advanced, the higher the Performance Index. 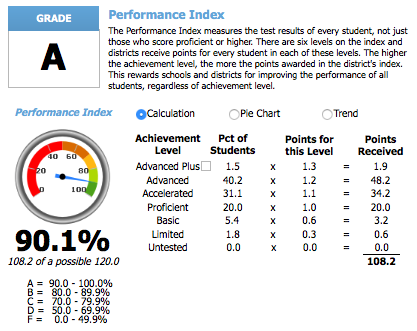 Our Performance Index of 108.2 was the sixth highest in the state. Our students scored at the Accelerated, Advanced, and Advanced Plus levels on almost 73% of the tests that they took. This resulted in an “A” in this category. The other Achievement grade is for indicators met, for which we received an "A." Twenty-three school districts earned an "A" in this category. The “indicators” refer to the percentage of students who passed the state tests and end-of-course assessments at proficient or above. At least 80% of students must score at proficient or above to “meet” the indicator. There were 22 tests measured, from third grade tests through high school end-of-course assessments. Ottawa Hills students met the 80% benchmark on 21 of the 22 tests, 8th grade English being the only exception. Seventeen of the 22 indicators were met with proficiency rates above 90%. Ten of the indicators had proficiency rates above 95%. The “Gap Closing” category basically looks at math and reading achievement along with graduation rates for ALL students. Gap Closing wants to know if students are succeeding in these areas, no matter the circumstances. Gap Closing measures the performance of subgroups based upon race, ethnicity, income, or disability to determine if students in these subgroups are passing math and reading assessments and graduating on time. We earned 100% of the points possible in this category, giving the district an “A” in Gap Closing. You will see that we did not receive a grade for the K-3 Literacy Component. This category rates how successful districts are in providing supports for struggling readers to get them reading at grade level by third grade. We do not have enough students in this category to qualify for a rating. 100% of our third graders met the Third Grade Reading Guarantee. The “Progress” grade is based on academic growth of students within a school year in math and reading, grades 4 through 8. This growth is referred to as “Value Added.” This can be a very difficult category for us because when students “meet” expected academic growth as determined by the state, the district earns a “C.” Only when students “exceed” expected growth can the district earn an “A.” This is a challenge for districts like Ottawa Hills when students are typically high performing students. It’s difficult to “exceed” expected growth when you’re already performing at or near the top when compared to your peers throughout the state. But this year, our students earned an “A” in all Progress categories. The Value Added grade for our students as a whole is an “A.” The Value Added grade for our students identified as gifted is also an “A.” We exceeded academic growth expectations as set by the state in both of these categories. This is no easy task. You will see that there is an "NR," or "No Report" for the Lowest 20% in Achievement or Students with Disabilities. This is because there must be a minimum number of students in these categories who are tested in order to receive a rating. "Lowest 20%" refers to those students who are among the lowest 20% in the state in performance on state tests. We have no students in this category. And while we serve and test students with disabilities in our district, the number isn't high enough to qualify for a rating. The fourth category for which we receive a rating is Graduation Rate. This category looks at the percentage of students who graduate in four years, and the percentage who graduate in five years. The five-year category acknowledges that some students with disabilities may need an extra year to meet all graduation requirements (and may legally do so). We received “A’s” in both of these categories with four- and five-year graduation rates of 100%. 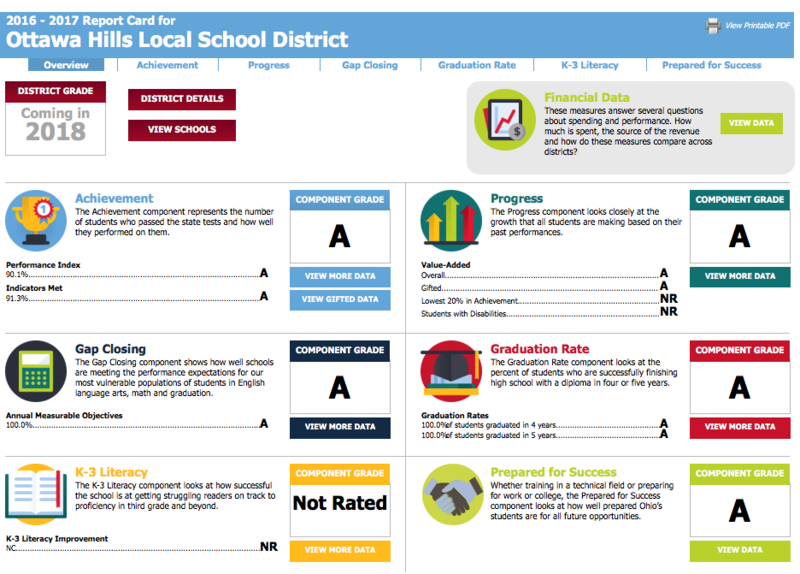 So that’s what a history-making Local Report Card looks like. We pause, we study the data, we see what we can learn from it, and then we move on, always with an eye on continuous improvement. The media will ofte n ask me what we are doing with the testing to be so successful on our Report Card. I told them that it wasn’t about the testing. The testing outcomes are a result of what is happening in our homes each evening and in our classrooms every day. It’s a result of intervention programs that help students improve their skills and master the standards. It’s about setting high expectations and then building the steps to allow students to climb as high as they can. It’s not about one-shot tests. It’s about daily effort. 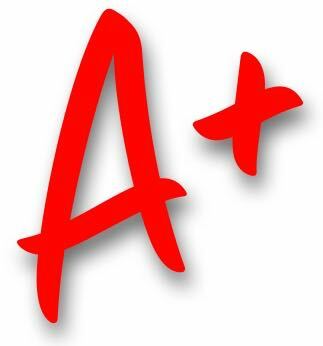 And in that category, our students, our teachers, our administrators, our support staff, our parents, and our community all receive an “A.” Actually, an A+.